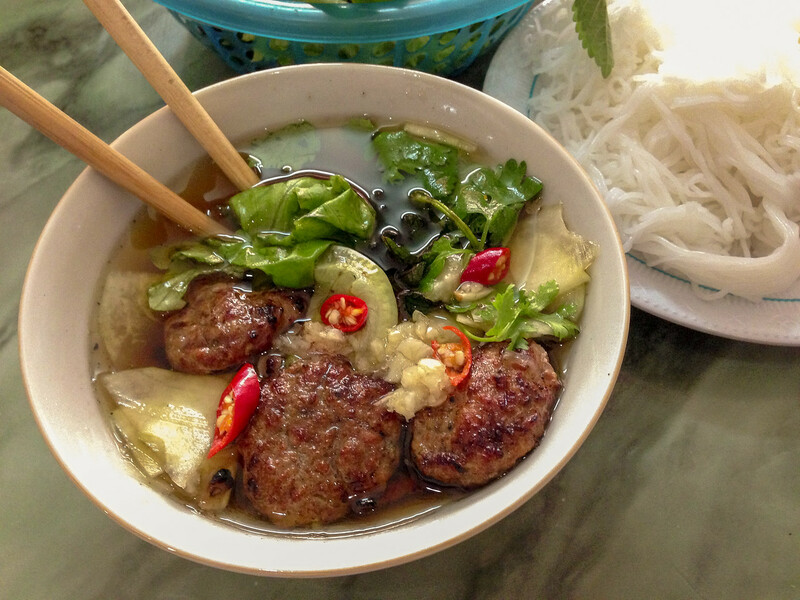 Bun Cha just gives me that warm, at home, feeling wherever I am in the world. When I arrived in Hanoi, Vietnam it was cloudy and cold. It was one of those days when just you want some comfort food. Fortunately finding good food among the old French colonial buildings in the Old Quarter is not much of a challenge; the air is filled with delicious aromas coming from what seems like hundreds of restaurants and food stalls. Honestly, it was all a little bit overwhelming for a neophyte Vietnamese food lover like me, but fortunately, I persevered and discovered it is difficult to go too far wrong in this food heaven. As I was walking down a street called Gia Ng? I passed by a nondescript little restaurant almost without notice. A few feet beyond though I was called back by the magical smell of pork grilling on a tiny charcoal cooker. I caught the eye of the owner and I could tell she knew what was happening and motioned for me to sit inside. I indicated as best I could that I wanted what was on the grill and whatever else she thought I might need. She brought me what is now my favorite Vietnamese dish; Bun cha. Now I know a noodle soup with pork doesn’t really sound that exciting but there is some trick, magic maybe, which transforms simple, fresh ingredients into perfection. Maybe it was the way the cool vinegary broth contrasted with the perfectly seasoned ground pork? Maybe it was the way the mint and other greens harmonized with the garlic and chilies? Whatever it was this dish alone is reason enough to return to Vietnam. This bowl of Bun Cha looks like a little bit of magic to me! Yum! Yes, it is worth a trip to Vietnam by itself. However, there are always good excuses to go to Vietnam! I really need to take a food travel sabbatical soon! Yes Stephanie you should! I think Vietnamese has become my new favorite food. Always open to revision of course.